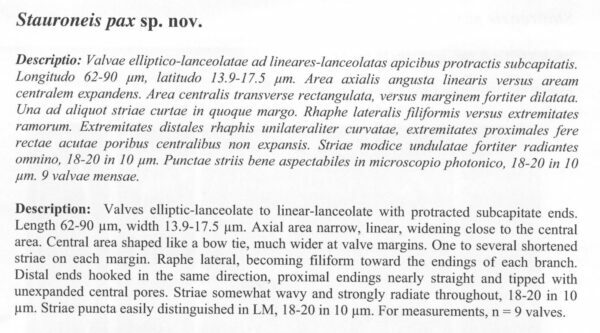 Valves are elliptic-lanceolate to linear-lanceolate with subcapitate apices. The axial area is linear, about three times wider than the raphe, and expands slightly near the central area. The central area is very wide at the valve margins and shaped like a bow tie. One to several short striae occur at each margin of the central area. Raphe branches are lateral but become filiform towards the distal and proximal ends. Distal raphe ends are hooked in the same direction. Proximal raphe ends are nearly straight and tipped with unexpanded central pores. Striae are somewhat wavy and strongly radiate throughout. Areolae are easily distinguished in LM and number 18-20 in 10 µm. In the Northern Rockies, Stauroneis pax has been recorded from two lakes, a river, and a spring seep. All but one of these sites lies within the Waterton/Glacier International Peace Park. 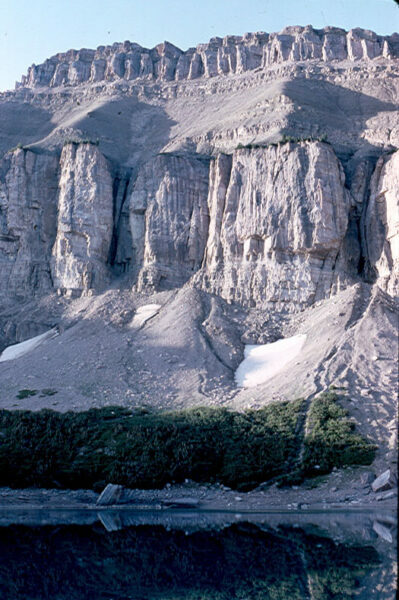 The remaining site, Lake Lavale, is in the Bob Marshall Wilderness about 100 km south of Glacier National Park. The pH of these waters ranges from 8.0 to 8.2 and specific conductance ranges from 149 to 183 µS/cm. Van de Vijver et al. 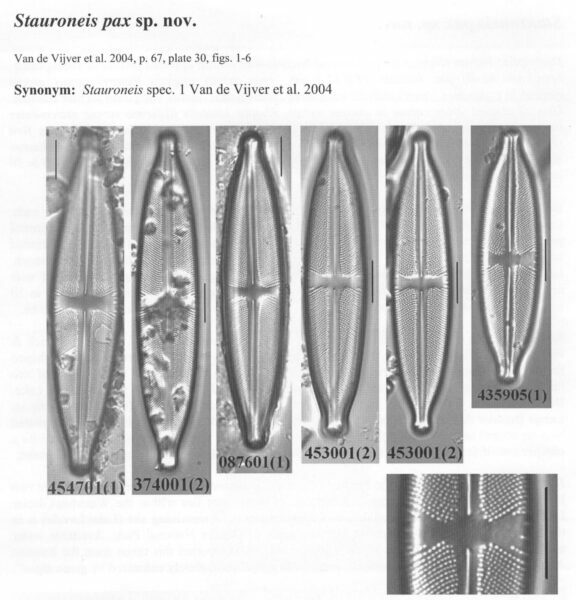 (2004) reported this taxon from the Russian Arctic, where it was found in “a small, very shallow ditch, completely colonized by green algae”. Lake Levale, Bob Marshall Wilderness, Lewis & Clark County, Montana: home of Stauroneis pax. Valves elliptic-lanceolate to linear-lanceolate with protracted subcapitate ends. Length 62-90 µm, width 13.9-17.5 µm. Axial area narrow, linear, widening close to the central area. Central area shaped like a bow tie, much wider at valve margins. One to several shortened striae on each margin. Raphe lateral, becoming filiform toward the endings of each branch. Distal ends hooked in the same direction, proximal endings nearly straight and tipped with unexpanded central pores. Striae somewhat wavy and strongly radiate throughout, 18-20 in 10 µm. 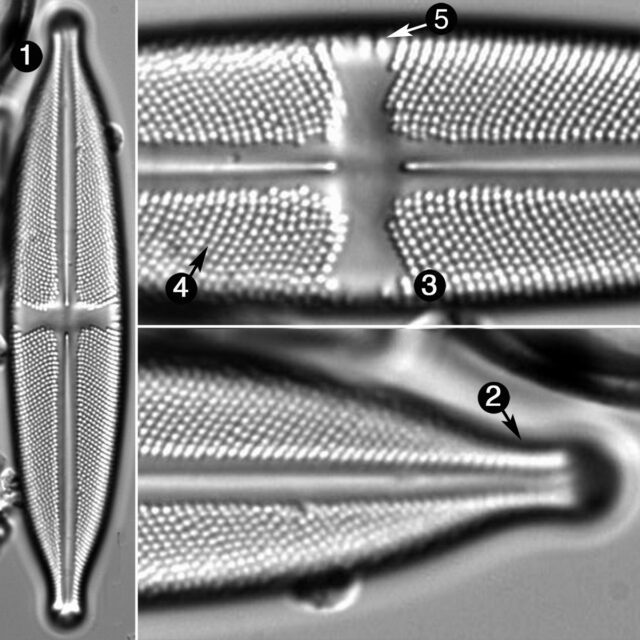 Striae puncta easily distinguished in LM, 18-20 in 10 µm. For measurements, n = 9 valves. Stauroneis pax has linear-lanceolate valves with subcapitate apices. The stauros is wide at the valve margins and shaped like a bow tie. One to several short striae are present at the margins of the central area. The striae are strongly radiate and are not straight.